The complex emotions and relationships within the mining community are vividly portrayed in this exciting, gritty, new dance production. 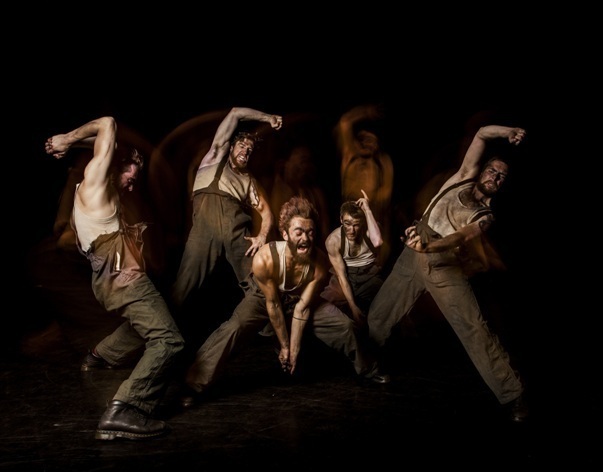 Choreographer Gary Clarke has used years of research and his own experiences growing up near the Yorkshire coalfields to masterly show not only the strong bonds of friendship and loyalty above ground but also the gruelling life underneath, in the pits. The imagery in COAL is its real strength and despite a fairly bare stage, it's the music, lighting and personalities that take the audience through an emotive journey. We follow the daily routine until the strikes of the 1980s take their toll and a gurning Maggie Thatcher gesticulates at the crowd (accompanied by the voice of actor Steve Nallon, who recreated Thatcher in TV show Spitting Image). We start off in cheerier times when the soundtrack is provided by a live local brass band - City of Birmingham Brass Band during the world premiere for DanceXchange at the Patrick Centre in Birmingham, but this will change according to each city on the tour. A busy housewife clatters pots and pans while moaning at her miner husband in a hilarious opening to the show. It's cleverly choreographed around a kitchen table and is teeming with endearment and fun with acrobatic dance. Moving on to the pits, we follow five miners as they head underground in a lift shaft. The brass band are replaced by darker, more menacing tones. It's far more atmospheric, almost claustrophobic, with a soundscape created by noise artist Daniel Thomas. Friendship and betrayal on the picket lines feature in COAL. Here, the miners movements are intense and jarring as they portray a hard life squeezing through tunnels, digging for coal and wheeling carts in a dark, misty backdrop. The demands on the workers' bodies have been beautifully mapped out in the dance, whether it is the jerking violent jumps of their coughs from the pollutant air or a scene where each of the men lie with their backs to the audience and each delicate movement on their bare torsos are intensified under spotlights. This show is not just about the miners though, it's also about the womenfolk in such a tight-knit community. Coming back above ground, there's a break in the action as the wives move around the audience offering trays of Wagon Wheels and the like before joining their spouses at a social club party. We all know this life of merriment is doomed and no more dramatically than the menacing presence of a blue-suited Maggie Thatcher cutting through the dancers as she signals an end to the party. Eleanor Perry as Thatcher is a highlight of the show. She gestures madly, dancing with staccato steps and dominates the stage with her movements whenever she is on it. The strike gets under way and a large screen shows footage from the picket lines. This is enhanced further with a monologue from a miner's wife, played by dancer TC Howard, who is exceptional throughout the show. Her tales of life during the strikes for the families and, in particular, the wives pulls no punches and adds a gritty and emotional layer to the production. A striking finale featuring a 'scab' and Thatcher on one side of the divide and the demoralised miners and wives on the other makes this a hard-hitting, challenging production. It's a fitting reminder to mark the strikes of 30 years ago that shows a real attention to detail and insight into a coal mining community broken apart and lost forever. Suitable for children aged 12 and older. Running time: 1 hour 45 minutes with no interval. Tickets cost £12 adults, children and concessions £8. World premiere -Thursday 11 February at 8pm. Featuring members of City of Birmingham Brass Band. 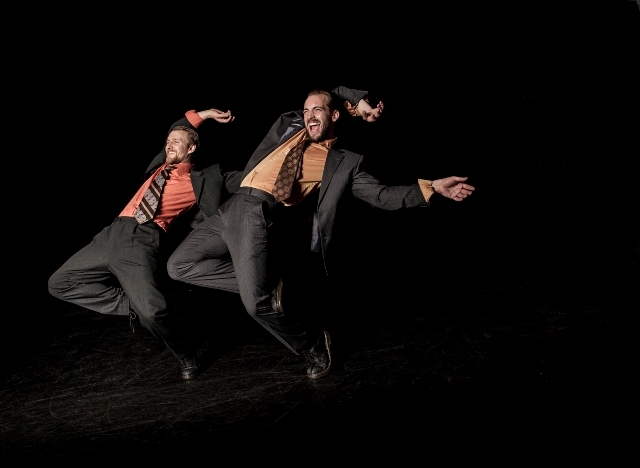 Visit the DanceXchange website for tickets or call 0844 338 5000. Featuring members of Carlton Main Frickley Colliery Band. For tickets call 01226 327000 or visit Barnsley Civic website. Featuring members of Carlton Main Frickley Colliery Band. For tickets call 01302 303 959 or visit the Cast website. For tickets call 01633 656757 or visit the Riverfront website. Featuring members of North London Brass. For tickets call 020 7121 1100 or visit The Place website. Featuring members of NASUWT Riverside Band. For tickets call 0191 261 0505 or visit Dance City website. Featuring members of Thoresby Colliery Band. For tickets call 0115 9419419 or visit the Playhouse website. More UK dates to follow COAL tour in the autumn of 2016 including Glasgow, Huddersfield, Derby and Canterbury to Durham and Caerphilly. Visit the COAL website for updates.